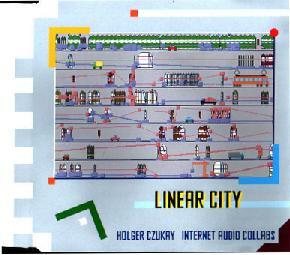 Holger Czukay and U-She - "Time and Tide" / Holger Czukay and Internet Collaborators - "Linear City"
The first two releases on Holger Czukay's new "virtual label" Dignose are dramatically different from each other, but still bear the mark of Czukay's unique vision. Time and Tide is a diverse album, rich in texture and exotic moods, it's music that is sensual, unpredictable, and often quirky. Yet it always remains within an accessible pop format. Call it pop music for people who don't like pop music. 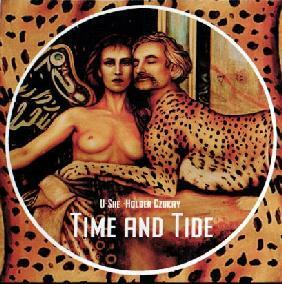 A collaboration with his wife, U-She, Time and Tide is Holger Czukay's first release on his new Dignose label. Fans of Can, who haven't followed Holger's career since the 80's, may be disappointed (though take note: two of the tracks on Time and Tide are built on some Can sessions from 1973, and feature Michael Karoli on violin, and Jaki Liebziet on drums! ), but those looking for something with the smoky, deep-voiced sensuality of early Nico, and the idiosyncratic pop spirit of Slapp Happy, will be in for a treat. The songs range from the romantically mischievous, like Trum, with its playful rhythm and humorous lyrics, to the ambient Without You, with it's deep breathing mantra-like vocals. Then there's the title track, with its soft, bell-like sequences, violin, and orchestral breaks, the tribal rhythms of Secret, and the sublimely beautiful Blue Sky, with its catchy bassline and strummed acoustic guitar. Throughout, Holger's bass is deep and profound, giving the music an air of mystery, underlying it with hidden meanings and half-whispered secrets. All in all, there are 16 tracks, recorded between 1993 and 1995, 12 written by Holger, 5 written by U-She (although U-She wrote lyrics for all the tracks). Can fans may find Linear City of more interest, however. Relentlessly experimental, inventively rhythmic, darkly ambient, it is amazing how cohesive a work it is considering its origins. The BBC sent Holger a recording from Sudan for him to remix. Rather than working on it by himself, he uploaded the recording to his web site and asked anyone out there who was interested to work with it, enhance it, basically do whatever they wanted to do with it, and send him the results. 23 enthusiastic contributors participated in the experiment, with Holger editing the results (as well as contributions of his own and from U-She) into 4 lengthy tracks. That the results are as coherent and interesting as they are is just as much a testament to the fresh, unbridled creativity of the collaborators as it is to Czukay's music editing and studio skills. Each of the pieces shift and change as they race across a dark sonic savannah. But rather than just stringing the collaborative bits together in a random fashion, Czukay cleverly edits them in recurring modes, so he ends up developing a thematic consistency to each piece. Here and there, the original Sudanese recording shines through, and there is a marked tribal feel to much of the percussion, especially on the 11-minute opening track, Africana Smooth. In contrast, the 11-minute Echo Girl has a more of an electronica feel about it, with voice samples and vocals melting in and out of the rhythms. The most varied piece, and perhaps the showcase of the album, is the epic 23-minute Ten Steps to Heaven, with its dark ambient stretches of ever-changing sound flowing over electronic and acoustic rhythms that shift and alter, sometimes structured, sometimes random, sometimes non-existent. African Suselita, the 18-minute closer certainly has the catchiest grooves of any track on the album (some of them lifted from the first track) and is chock full of intriguing samples ranging from roaring airplanes to big band orchestras to Holger's beloved short wave radio broadcasts. Put this one on in a dark room, lay back, and let it transport you to a futuristic, altered African landscape that lies on the edges of reality. Highly recommended. You can visit Holger Czukay's web site at: http://www.czukay.de/. Visit the DIGNOSE label web site at: http://www.dignose.com/.